Black Sabbath have announced a new vinyl box set showcasing their singles in the 1970s. 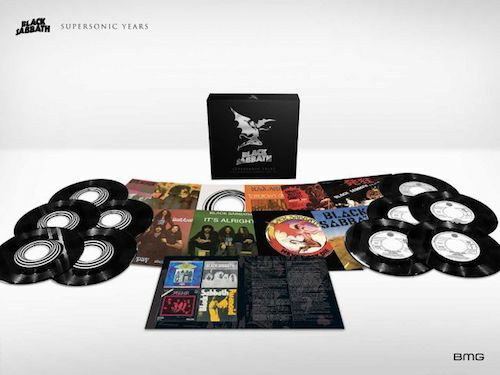 Titled Supersonic Years – The Seventies Singles Box Set, the 10-disc set will be released on June 8th through BMG – two days before Ozzy Osbourne headlines Download festival. The box set includes 7-inches of Iron Man, Evil Woman, Paranoid and more, remastered by Andy Pearce. Each single also includes ultra-rare or exclusive color sleeves. There are also five rare edits of Iron Man, Sabbath Bloody Sabbath, Am I Going Insane (Radio), Hard Road and Symptom Of The Universe, alongside new liner notes detailing all the rarities inside. Supersonic Years – The Seventies Singles Box Set is available for pre-order now. $70 for 20 songs that I have already? I think that I’ll pass. I can appreciate the historical aspects of something like this but it is definitely overkill. I’m interested in the Tony Martin era remasters that had been mentioned about a year ago. That would be way more interesting than this stuff. Remember when it was just the first 8 albums and WE SOLD OUR SOULS FOR ROCK AND ROLL. No live nonsense or unreleased garbage. That was a band with integrity. Since the ’97 Reunion album, there have been 2 of the exact same box sets, a live retro album, 2 DVDs, 13, double disk remasters of the first 3 albums, another greatest hits package and who knows what else. The business aspect is watering down some proud timeless music. What will be the legacy here? Greed? Time to let the old material speak for itself and stop messing around with greatness.